Fast ?. – Dirty wet dog , boats and sailing. Lets face it : sailing boats aren’t fast at all except for a few AC boats, Volvo 70’s and IMOCA 60’s. I was accidentally overhearing a conversation at the marina in which one yachtsman was extolling the sailing performance virtues of a new boat at the club, something like this. But fast ? no not really, maybe marginally less slow than something of a similar size but labelled as a cruising boat but only incrementally so and only at the expense of a huge sail wardrobe that needs a large crew to handle and with the downside that the whole deal is good for little else other than a Saturday dash around a few buoys and maybe a faux-silver cup at the end of the season. Forgive the cynicism today, its a grim wet day here, the boat is now somewhere else so i can’t go and tinker and nor do i have any desire to start tackling any of the outside work here today..i should be out in the garden, maybe later. Alright so i am no longer enamoured with twitchy race boats with delicate rigs and ‘shouty’ owners but rather boats that go places and don’t cost more than one arm and one leg !. Today though my actual intention was to address performance in the kind of small un-pretentious boats that i now sail : i was thinking about this a lot when we made the cross channel passage back from Brittanny last year and again when i made my escape dash last week. My point here is not just that most of our small sailing boats aren’t fast in any real sense but that many boat owners are careless of what little performance the boat has and frequently reduce , by neglect, what little is there. All displacement boats, and that accounts for just about all cruising and cruiser-racers have a waterline limited speed limit : yes for sure an oveloaded ‘race’ boat will sometimes do better than that for short periods and great fun it is too but generally the limit is a hard one except that we make it worse ourselves by not attending to some basics. Here is a little story along those lines : going back a couple of boats and the one i don’t talk about much was one that i picked up cheap on ebay as a project and one that i intended to rebuild and make good. The boat was a Deben, 4 ton i think, about the same length as the Liberty but much heavier and allegedly a ‘classic’ yacht. 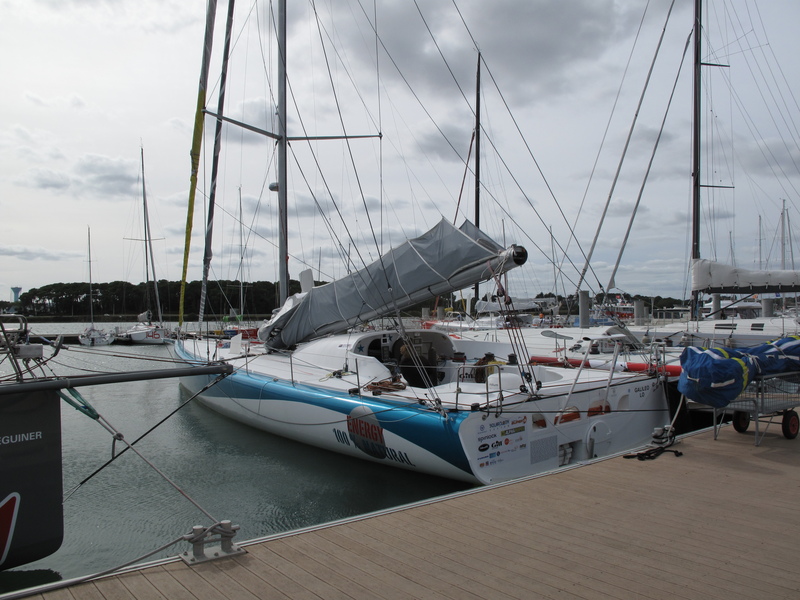 I took her over at a marina in Chichester harbour, set her up very basically and sailed her back to Plymouth in a couple of sessions over a few weeks. She had no internal engine, that had been removed although the stern-gear was still there with a huge aperture in the rudder, she was i think originally gaff but had been converted (badly) to a bermudan cutter with a tired ally mast and a short bowsprit…no winches and all the sails were definitely other boats sails : i seem to remember that the mains’l was short in the hoist by some 3 feet !. Anyway : i cleaned her bum, centred and tightened the rig and set off, downwind and reaching wasn’t so bad as she had a big spare unused genoa (no winches though) and on the first day was happy to be keeping up with boats like longer slippery folkboats. Upwind was an entirely different matter as i could only sheet the one decent sail by setting up a hand-tackle to get some tension in the luff and the mains’l may as well not have been there. Of course she leaked like a seieve too and i remember ‘larding’ her seams before one section of the passage. There was this one day though : i had anchored behind Hurst castle overnight and pulled out of there early the next day to catch the ebb out of the Solent, i got sail up, in fact i had worked up a way to rig her temporarily as a cutter again and my course across towards Poole was just off the wind so i could just get the genoa to trim to that course, it was quite light pleasant sailing and i guess i was making the boats available hull speed minus a lot of drag from the prop and apertures. Behind me a much more modern and longer cruiser -racer had also come out and he looked as though he was going to overtake me slowly to windward : i kind of ignored him once i knew he was there and carried on making a brew in the cockpit with my camping stove balanced on a block of wood to loo-ard in the cockpit. Brew made and therefore in full cruising mode i had a look around for the other guy : he had tried ‘high’ and lost ground, now he was crossing my stern about 50 yards back and trying to go through my lee…and failed. About an hour later and after a lot of tweaking and various high-low attempts he gave up and motored past me and was grumbling about my ‘advantage’ with my 3 sails against his 2….what !. Its true, even with a longer, lighter and more modern boat with a taller stick and new-ish sails he couldn’t overtake a completely knackered 60 year old cruising boat with very old sails and all-but no trimming ability. It did reinforce my plan which was to get the boat home and on the hard, to totally dry out the hull, smash out her old caulking, spline her and cover her with veneer, glass and epoxy and then attend to the rig. I was going to take the old stern-gear out and close the aperture and lots of other jobs to make a hybrid ‘classic’ maybe with a more modern pole-rig gaff and better sail handling gear. What actually happened is that the rest of the trip home made me really, really hate the boat : she seemed to have a very bad temper and character as a boat…if you believe that boats have characters. I tidied her up a bit and quickly sold her on to someone else who had fallen for the ‘classic’ fallacy. The point here is this though : that even with all the problems that boat gave me i was still able to out-sail several boats much more modern of a similar size and why ? as i hadn’t i felt done any of the basics that i would do with a boat now. It really made me question the so called ‘performance’ qualities of more modern boats but what i did next was to save up a lot more and then bought my ‘project’ Frances, the boat i had always wanted and with that boat i set out deliberately to make her the ‘best’ small offshore and ocean going boat that i could and remember that small gains made all the time is what eats the miles…not short bursts of manic speed. That exercise of improving and fine-tuning over several years with a good basic boat taught me lots more about good boat preparation and long distance short-handed sailing and cruising performance. In part 2 of this series i will post about the things i did to make the Frances 26 as smart a boat as i could. Obviously contains video content that isn’t mine, will be taken down if asked ! Previous Ships in the night. Good piece, but you have overlooked one thing you know how to sail properly ! We have “outsailed” several cruising boats with some attention to trim etc last trip to the BOI we thought that one guy was motor sailing but …he was not ! typical overseas cruising boat great down wind, well no average and the waterline moved up each year as the junk accumulates on board ! Great stuff. Looking forward very much to part 2.